Deep-fried eggs are really popular in Asia. 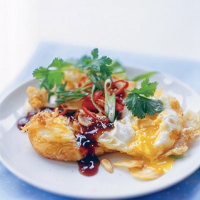 While we love our fried eggs with brown sauce, Chinese people half way round the globe eat their fried eggs with another thick, brown condiment - oyster sauce. Done well, these eggs should come out with a really crispy white and a runny, golden yolk. This recipe is a modified version of one by the fabulous Australian-Chinese chef Kylie Kwong. Heat the oil in a wok or saucepan for 2-3 minutes, over a medium heat, until fairly hot. The oil's surface will begin to shimmer and move when it is hot enough. Add the garlic and cook for 30 seconds until lightly golden, then remove with a slotted spoon and drain on kitchen paper. Crack the eggs into a bowl and slip them into the hot oil. Stand back, they will bubble up and crackle. Turn the heat down immediately and cook for 2 minutes until crisp underneath. You want the yolks to remain runny, so don't overcook them. Remove the eggs from the pan with a large fish slice and place on a plate covered with kitchen paper to drain off the oil. Serve the eggs on a warm platter. Drizzle over the oyster sauce, scatter with the golden garlic, salad onions, chilli, coriander and give them a shake of white pepper. Divide the eggs with a fork and serve on noodles or rice. A spicy, full-bodied Champagne is a remarkably good match with this dish, because of its cleansing acidity and well-masked hint of sweetness.